A Missive From Dave ?? Yes friends, it's that time again... Time that I left work and forgot to log off my PC. What, prey tell, happens when I forget to log off? The mysterious "Hit and Run" emailer leaves his or her "Mark" in my sentbox. While this mystery person is creative, and has a strong vocabulary, I question his/her sanity. I also worry about possible demonic possession (i.e. Linda Blair). You may have been a recipient of one of this person's prior emails - you may not have. But, rest assured my dear friends, and family - I have not lost "as many" of my marbles as you may have thought when you opened your email box this morning. For posterity sake, I have included the message that was sent out (on my behalf) for your reading enjoyment. Oh, be not angry at this "mystery writer" - nay, feel pity for him or her, as I feel he/she may have much deeper, much darker, and much more sinister demons to deal with than even I. Think not of revenge for this email terrorist. Dream not of using a "Blade" - "oh" no - for it is forgiveness that I feel in my heart, as I urge you to feel... Both, Forgiveness and pity. "Ahahahahahahahhaha a little delayed but I got this now at work too!! Hmm, did Dave leave his email unattended again?? " Pink eye??? Quit picking your nose and rubbing your eye with your finger. Any other life problems I can help you out with? I believe too much time has passed since my last missive, and with that thought, I want to share some of the things that MISSED my blog – The Life of a Father of Five. Recently, I self-diagnosed conjunctivitis in my right eye and with proper medication prescribed by a licensed physician; I should fully heal within a couple of days. Luckily, it wasn't the feared Blepharoconjunctivitis, Keratoconjunctivitis or Jumpinyourfacetofightus. I would be spared some of the pain and embarrasment, at least for now. Hopefully, I will remember to wash my hands, and if not, well . . . re-infection is not out of the question. With the recent political climate, the last thing one wants said about them is to be called red or, in this case, pink. "Pink Eye" – sounds like something the dear Republican Senator Joe McCarthy might call you if you were looking to become a communist. Unlike today's claims that there are large numbers of terrorists, anti-government spies and sympathizers working inside federal,state and local government, his public attacks on the character or patriotism of political opponents were cruel and unsubstantiated. I thank God every day, that our great country doesn't condone such behavior and lies.
" He had always been a heavy drinker, and there were times in those seasons of discontent when he drank more than ever. But he was not always drunk. He went on the wagon (for him this meant beer instead of whiskey) for days and weeks at a time. The difficulty toward the end was that he couldn't hold the stuff. He went to pieces on his second or third drink. And he did not snap back quickly." Why, that's it! I am older now, and unable to snap back quickly, just like Senator Joseph McCarthy! For you conspiracy theorists or those of you who actually follow the news - and not that drivel on the Fox Opinion Channel – you will have heard about the 2,750th victim of the 911 attacks - Felicia Dunn-Jones, a civil rights attorney from Staten Island who died five months after 9/11. It also opens the door for the families of others who fell mortally ill after contact with Ground Zero dust to demand they be included on the list of victims and at the memorial. Now, you say to yourself, what does 911 ground zero, the 2,750th victim and Dave have in common? I can't answer you. I just can't. If I could mention something about building number 7, let's say Larry Silverstein, in New York, actually directed the World Trade Center Number 7 be pulled, meaning brought down by controlled demolition. In February of 2002 Silverstein Properties won $861 million from Industrial Risk Insurers to rebuild on the site of WTC 7. Silverstein Properties' estimated investment in WTC 7 was $386 million. So: This building's collapse resulted in a profit of about $500 million! I mean, if I were to mention something . . . Anyway, dust has always bothered me, especially my eyes. And by the way, when one flies standby on an unnamed national airline, you DO NOT get bonus frequent flyer miles for having to wait in the airport for SEVERAL days while the FAA and the GOVERNMENT have ALL aircraft GROUNDED (except for certain friends of George H. W. – A.K.A. the Bin Laden family). So, if one WERE to be exposed to toxic dust several years ago, one MIGHT be in line for some compensation. I'M JUST SAYING . . . ! Yesterday, as I was in the basement, my kids ran in the house shouting for me. They said there was a big accident across the street, and they saw the whole thing. I asked them if anyone one was hurt, and the said they did not know.. So, I grabbed the phone, and ran outside with it - (NOT making a 9-1-1 call before finding out anything...). I noticed a missing boulevard tree. I noticed a car up on my (kiddy-corner / across the street) neighbor's driveway / side yard with the missing boulevard tree crammed up under, alongside, and in front of the car. With my keen observation skills, I was able to determine a couple of things. #1 - The driver (if injured) was pretty much o.k. She was out of the car and walking around. #2 - The homeowner (who's lawn the car ended up on) was standing in the driveway next to the driver and obviously on the telephone. So, rather than choke out another 911 line and tie up another police dispatcher in a vain (and useless) attempt to "be the hero" - I used the common sense that the good Lord gave me, and realized that I did not need to place another (useless) 911 call. 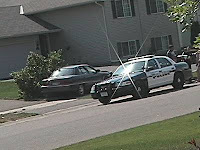 #3 - There were already two residents, and the driver "at the scene". Then there were four of my children, and two of the neighbors children all "rubbernecking" it from our side of the road. There was no need for me to linger... I did not see the accident, no immediate aid was needed to be rendered, and there were already too many observers. I went back inside and finished up what I was doing when this all happened. Now, I know you are all going to point out the obvious... "But Dave, you have pictures of the accident - you must have been out there for a while." Not true. You see, yesterday was Wednesday, and Wednesday the Scott County "Household Hazardous Waste Facility" is open. Part of the day's agenda was to take a bunch of used motor oil and oil filters up to the HHW drop off. So, being the diligent blogger that I am - the thought of a C-R-A-S-H-! post came to mind. I grabbed the camcorder (with the 20x lens) and took a couple of photos from deep within my garage. They never even saw me. I was back to cleaning up my oil within moments. By the time I was done packing my HHW into a box, and in my trunk for transport, the Jordan Police had left, and all that was left was a downed boulevard tree in the neighbor's driveway/side yard. About an hour later, a couple of guys in pick up truck (armed with chainsaws) had the tree cut up, loaded up, and gone in about 20 minutes. All evidence of said incident (minus a couple of "mailbox issues" and a broken off tree stump in the boulevard) was gone, and life returned to it's previous state of ordinary placid suburban bilss. I have a three car garage. When we moved in - There were a few items I did not want the builder installing. I did so because those items would then be forever (or at least for the next thirty years) financed through my mortgage. Well, it has been just under eight years now, and (while always intending to), I never got a garage door opener on the third (single overhead door) stall. Well, due to a recent upgrade to his garage, Ed offered me up a barter I could not refuse! Ed was going to give me his old garage door opener (underpowered for his new "Mega Garage Door"). I told him I could not just "take" it, and we worked out a deal that involved a garage door opener for some cigars and Jagermeister... (I have yet to deliver on my end of the barter - so Ed, if you are reading this, I have not forgotten!) When I was up at his house helping him roof, he sent me home with the opener. It has been sitting in the garage all disassembled and boxed up since then. Today (my last day off before having to return to work) my goal is to have a working garage door opener on that third stall. If nothing else, it will be a good excuse to spend the day in the garage, smoke a cigar (or two), have a beer (or three), and listen to Ron & Fez on XM! It is now 2235 hours (10:35 pm). In the usual "Father-of-five" fashion, things went "less than ideal". I did log off at 0900 this morning, and headed upstairs to get started. I found the aftermath of Hurricane "My Children" in the kitchen, and so - by the time FEMA and I were finished cleaning up, it was pushing 1000. I went out into the garage, and since the third stall is where the kids keep their toys, I also had get involved in another "disaster recovery" site. I did get the (disassembled) opener assembled. I was able to attached the non-motorized end up against the garage header, and I started find where the best places for my angle iron, and straps - when I heard the distinct sound of one of my children crying. By the time I was able to degrease my hands (remember.. it is a used garage door opener), and comfort Melissa, I had to use my CSI skills to decipher what the other hoodlums children where up to in the house while I was outside in the garage. I had them clean this mess themselves, and realized it was time to get them lunch before our 1 pm appointment. Between 9 am and 3pm (by the time I came home from my appointment) I had a total of 1 hour and 5 minutes of actual work done. Thankfully, by now, my wife was home and could care for the children - so I started right in. From 3pm - 5pm - Everything that could go wrong did. Little things, like dropped tools, lost hardware, and raging heat - to big things - like a misaliged chain (that crammed the slider into the motor, and required some disassembly (of what I assembled this morning), to a misfeed and then completely detached garage door cable. By 5pm my wife had dinner ready, and I had all that I could have for the day. I lowered the door, latched it shut and called it a day. After dinner (and cooling off a bit) I decided to investigate the problems. A couple of quick adjustments to the spring and the cable drum, and the door was realigned and back on track! Building on that success, I decided to actually try to realign the cable/chain/shuttle, and on the first try - everything lined up with about a 95% success rate. I did have to make a few last minute "tweaks" but even that went well! Although the day started out badly, it ended up on a good note. The opener is installed and operating perfectly. I have a few small things to finish (routing the sensor wires, installing the sensors, and routing the main button wire), but these are (for the most part) cosmetic in nature, and should pose no problems what so ever. Back to work tomorrow afternoon, and I will (again) be training a new dispatcher. Wish me luck. Yesterday (because we only had Melissa (the "yougest of five") home with us, Michele and I decided to go out and do some grocery shopping. This trip would include three grocery stores and one "Home Improvment" store. Because it was going to take all afternoon (and becuase "two adults and a three year old" is much cheaper than "three adults, four children") we stopped by a local Asian Food Resturant near our shopping haunts. When it came time to read my fortune, I could only shake my head in an inronic disbelief. 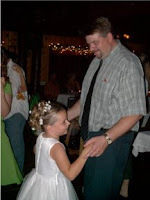 Be sure to drop down below the "What it's like being a father" post and check out the completed Family Wedding post! What is it like being a father? 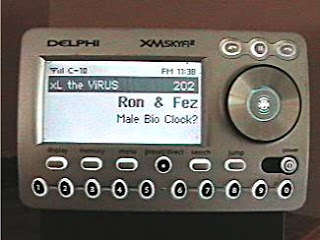 I have also talked (many times) about what I consider the best damn radio show on all of AM, FM, or XM - The Ron & Fez Show on XM's Channel 202 - The Virus. I'd pay my XM subscription just to listen to Ron & Fez - everything else on XM is a Bonus! While making the kids lunches, and cleaning the kitchen this afternoon, I (as I do almost every day) was listening to the buddays. This afternoon my radio buddays literally hit one out of the park! They were discussing the virtues (along with the trials and tribulations) of fatherhood. Today's shows was OUTSTANDING. I think today's show should be a "must hear" for all current, former, and soon-to-be fathers! Today's show provided one of the best descriptions of fatherhood I have heard in a very, very long time. It was funny, serious and sarcastic all at the same time. It truly hit the nail on the head. (Note to self: Enough of the clichés). I will try and find a source to download a copy of today's show (for those that are interested...) and get the link put here. Ron & Fez also replay each day's show at 11pm (Central time) on XM 202 (The Virus) - if you are already an XM subscriber. Good Job buddays - you really did hit one out of the park today! You guys ROCK! One of the major family events this season was the wedding of one of my wife's brother (or, as I like to refer to him as... my "brother-in-law"). 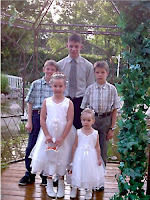 I chose my summer work schedule around this wedding, as I was not guaranteed the ability to request the time off. By choosing the shift and the rotation I am on, I was able to have the two days prior to, and the actual wedding day off. (i.e. - able to help prepare for, and attend). The down-side was having to be back to work (and not able to get the day off) by 3pm on the day after the wedding. Normally, this would not be an issue, but since the wedding was held over 400 miles (about seven hours) from home - it would mean a quick turn around and long drive right after the wedding. First of all, one of the BEST parts of this whole vacation (at least for me) was my lack of planning, or should I say the lack of planning required by me. For this, I need to thank my wife's sister (or, as I like to refer to her as... my "sister-in-law" (see a common theme here?)). Mary, I would like to officially thank you for all the work you put into the plans. You did an extraordinary job, and the accommodations were EXCEPTIONAL! I am planning on raising a cool frosty mug in your honor! So, let's start from the beginning... As stated, all I had to do is show up (well, among a few other thinks like packing, driving and paying for our portion of it). When we left, I knew that we were going to be staying at a large "group" cabin for the first two nights, and (because of a previously made reservation) we had to check out of the cabin, and move to a local hotel on the last day/night. By now I know you are all wondering / asking yourselves / begging me to "get on with the details" of where we stayed. Unbeknownst to me (at the time) the cabin we were staying at is all part of the same "White Pines Inn". The White Pines Inn is made up of many components. But for the purposes of this blog entry, I will talk about the parts we utilized. The "group" cabin we stayed at was one of the White Pines Inn Pine Creek Cabins. We stayed in "Knotty Pine #128"
The wedding itself was held at the White Pines Inn Wedding Canyon. This is an old limestone quarry that was drained, and redecorated into a beautiful setting. 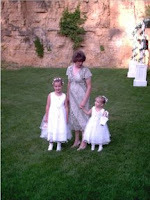 The Canyon has several wedding "stations", and are all very delightful. As you can see from the map, The White Pines Inn Wedding Canyon (2) and White Pines Inn Pine Creek Cabins (3) are directly across the street from the State of Illinois White Pine Forest State Park (1). Don't ask me how, but the White Pines Inn Garden Canopy and the Janssen Reception Hall are actually located within the White Pines Forest State Park. It was very odd to see a private business held in a State Park. Very odd, yet very convenient! You see the "Minnesota" relatives of the Groom stayed at the Pine Creek Cabin, and a group of the Bride's family traveled from Tennessee, and parked their motor home at the White Pine Forest State Park. 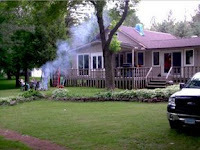 The cabin had a full kitchen, a huge dining table (that sat eight), satellite TV, two bathrooms (one with a Jacuzzi tub), a gas fireplace, air conditioning, BBQ, and a giant fire ring outside the back door with an Adirondack swing. Sleeping accommodations included two bedrooms, one with a king sized bed (and its own bathroom) and another with two queen sized beds. There was a loft with two twin beds and a futon, and the two living room couches were hide-a-beds. There are a few pictures, a description, and a link to a virtual tour located HERE (on the Pine Creek Cabin page). 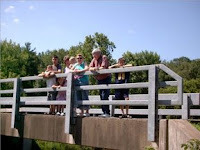 The next amenity we had access to was the White Pine Forest State Park (Links HERE and HERE). They had a (small) playground, a flowing creek, and a nice sized (and well stocked) gift shop (that housed "Max", the talking and waving Parrot). There were hiking trails and “species” forest (an indigenous tree of several species planted in a field, with signs identifying each tree’s species). 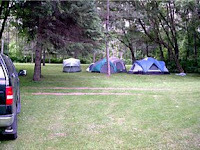 We partook in several of the State Park’s amenities at various “down times” throughout our stay. The park was delightful. After a quick “rehearsal” at the Wedding Canyon (more on that later) – we had the groom’s dinner held at the “Garden Canopy”. The Garden Canopy is an oversized patio, with (you guessed it!) a canopy covering most of it. It seats a large number of people, and has some nice accent lighting. At the far end is a bird bath that reminds me of one of those serenity fountains. It drew all the children like a magnet. We ate “my kind” of groom’s dinner. Hamburgers (served “California” style) and Bratwurst! (Any kind of “coarse ground” meat served in “tube” format is A-O-K in my book! I have a strong desire to experiment with trying to make my own “tubed meat” – but that is a post for another time.) I did exercise another act of “civil disobedience” while at the dinner. I will refrain from talking about here, but those present know what I am talking about! 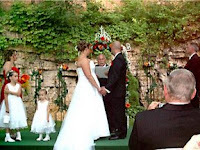 The actual wedding ceremony was held at the White Pines Inn Wedding Canyon. Again, this was an old limestone quarry, and was drained and decorated to facilitate some very beautiful outdoor weddings. They have a man made pond in the center of the canyon, and it pumps back up the hill, and creates a lovely waterfall from the one wall, and then a small creek from the waterfall, back to the pond. There are gazebos, tents, canopies, flower beds, small bridges, and water features all over the canyon. It is truly a memorable experience! It’s hard to describe. 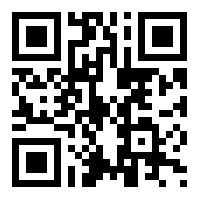 I suggest checking out this LINK, and viewing the pictures and the “virtual tour(s)”. Finally, the wedding reception was held at the Janssen Reception Hall. This too was wonderfully rustic appearing hall. It had hardwood plank flooring, timber beams, and was decorated in early American Log Cabin styling. We had a great time at the reception, and we even got the boys to dance the “dollar dance” with their new Aunt (it was like pulling teeth to get Jonathan to do it, but he finally gave in.) My camera’s memory card was full by this time and (to Jonathan’s relief) I did not get any pictures to “blackmail” him with. As the evening started winding down, my wife’s father (or, as I like to refer to him as - (yup, you got it!) my Father-in-law) broke out the Arturo Fuente Curly Head Maduro cigars (a vastly superior cigar than I am used to smoking). This was a perfect “wind down” to the whole event. 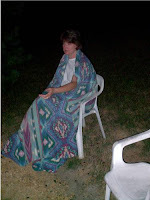 Several of us stepped out to the cool night air, and fired up the cigars, and sat around the benches, enjoying the cigars. A little background story regarding the cigar ritual… During our first two nights (around the campfire) Joe and I smoked some Backwoods cigars I brought along. The first night, Benjamin (the 19 year old or “oldest-of-five”) joking said he wanted to try one. No one commented, and I heard nothing more from him about it. The next night he again said he wanted to try one. This time I bit, and offered him one. He nervously chuckled and turned it down. The other boys started teasing him about being afraid (in true “younger sibling pressure” fashion), and asking him over and over why he did not want to try one… I quickly shut them down, and in all seriousness told them that if he did not want one, it was not right to push the issue. (See everyone… Believe it or not - Once and a while I DO have moments of "positive parenting"…) That night after showering, changing into our “pa-jammies” and (literally) walking into the bedroom to crawl into bed, Ben called me out, pulled me aside, and whispered (in a nervous voice) if I could hold on to the extra cigar so he could try it the next night… I chuckled, and told him I would. When “cigar hour” arrived at the reception, his grandfather offered him one of the premium Fuentes in place of the little Backwoods cigar I had saved for him. He partook in the cigar(hisfirst),and seemed to have weathered his way through it. At first he produced very little smoke, and the cigar appeared to be drawing very slowly. I re-clipped the end, and took a couple of deep hits off his cigar to really get it going. After my attempt to “enhance” his cigar, Ben’s first drag was followed with a “whoa – that IS strong”. After the fact, when asked, he claims to have enjoyed it. As cigar hour wound down, many guests were starting to leave. Towards the very end, my wife, carrying one sleeping daughter, followed by another daughter in a “zombie like” state joined us, and (as all good husbands can attest to) I got that “let’s move it along there big guy” look from my wife. I milked out the cigar as long as I could (then set it down in an inconsipcious place), grabbed the rest of our stuff from inside, said our goodbyes, went back outside (grabbed what was left of my cigar again) and took the last few hits off it as I walked out to the van. We all returned to the hotel, packed, and (because my brother-in-law, Ben, and I had to be back by Saturday afternoon) we went to bed so we could get an early start the next morning. The next day started at 5:30am, and we were on the road by 6:05am. After an uneventful trip (and a few text messages from Bill) – I arrived at home by 1:30pm – with thirty minutes to spare before having to leave for work. If you have not yet viewed all the "virutal tours" - May I recommend THIS PAGE. The day (and weather) was beautiful, you both looked fantastic (as did M----), and speaking of M-----, he did a super job with all the busy activity going on! Honestly – everything fell into place just as it should have. 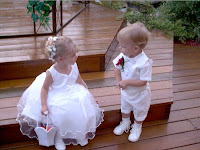 From my perspective (as an observer), your wedding day was perfect! I hope it was all you hoped it would be, and I hope your marriage brings you all the happiness that ours has brought us. We look forward to many years of celebrating birthdays, holidays, functions, events, and “just for the heck of it’s” with your family. And lastly, I’d like to wish you just a very simple yet heartfelt “congratulations” to both of you. 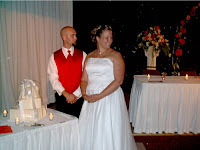 This (incredibly long) post was written in honor of B, J, and M N who were joined in matrimony on 07-13-07. A couple of days ago I had the opportunity to share a couple of valuable lessons with my children. The lessons: Discretion, Good Judgment, and Civil Disobedience. I used discretion and good judgment today when the kids and I hung fliers on the lamp posts throughout my neighborhood. I used discretion and good judgment because hanging the fliers was an example of civil disobedience for violating what I am sure is some sort of “heinous violation” of one of the sanctified “covenants” of our neighborhood’s homeowners association (not to mention a flagrant violation of some city ordinance). You see, I found out on Saturday that some time the day before, a door had been left open in our house. Ignore for a moment the fact that on a ninety degree day someone in our house insulted our (often ignored, yet beloved) air conditioner as it exerted itself in a feeble struggle to sustain a comfortable level of humidity within our home – you would think that the fact that we have an ADHD dog that (at the first possible opportunity) will run out the door in a desperate attempt to find anything she can chase (and as far and as fast from home as she can), and two “strictly indoor” cats - would be enough of an incentive to keep the door closed… But it was not. Somehow, someone left one of the doors wide open. We struggled to keep him immobile, and many times found him climbing, running and jumping with the cast on. We woke up one morning (about two weeks ago) and found Garfield making his way up the stairs – cast-less and with an ever-so-slight limp (like he had not used the leg in a few weeks). We quickly located the cast in Jonathan’s room. It had fallen off two weeks early (which the vet told us to expect). Garfield has been doing fine ever since. I never did bring him in for a follow up appointment. The vet wanted to do more x-rays and a follow up appointment after the cast came off. This would mean another visit to the vet, x-rays, and other miscellaneous associated fees. This “follow up” would cost an additional $150.00 - $200.00. All total – I have close to a thousand dollars invested into Garfield (between shots, neutering, de-clawing, and the broken leg). I decided to save the other $200.00 on the follow up, because –frankly- if the leg did not heal, Garfield and I would have gone on a little “early” hunting trip together. Even without the “follow up” visit to the vet, I still have around $700.00 invested in this $5.00 farm cat. Imagine my surprise when I came home and found an incestual feline act going on right before my very eyes – several months before we “expected” this sort of thing to start. ...we were unable to afford to get both Garfield and Mimi fixed and de-clawed at the same time. We chose to have Garfield neutered – that way he would leave Mimi alone. Overall, the plan has worked out well. Mimi will (once and a while) go into heat, but Garfield has ZERO interest in her. This makes the total investment in Mimi, around $100.00. (Significantly less than the $700.00 I have into Garfield). So, when the wife “sat me down” to break the news about the missing cats, I could not help but imagine our cat a big bag of money being run down in the street (with bills and coins “squishing” out of it from all directions), or a little old lady feeding our cat an overstuffed bank bag (with my name on it), then snatching it up and bringing inside her home. As the day went on, I was more and more sure that the cats my money were gone, never to return. The kids were gloomy, and even Molly (the ADHD cairn terrier from hell) was not herself without the cats. At one point, I spotted Jonathan (elbows up on the railing, head in hands) on the deck watching over the (several) yards around. Garfield is “sort of” Jonathan’s cat, and Mimi is “sort of” Rebecca’s cat. (Humph… If you would look at my checkbook, it would appear that they are both MY cats….). 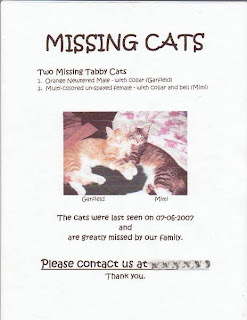 Wanting to “appear” like a caring father recover my money , I made up some “Lost Cat” fliers to post around the neighborhood. I was going to do so - knowingly breaking both a neighborhood “covenant” and a city ordinance. As I finished the fliers, my brother-in-law arrived for a visit. So, the brother-in-law, myself, and four-fifths of my collection of children set out to tape up some fliers. Before we put the first flyer up, my brother-in-law had spotted (what he thought was) Mimi two doors down, in a fenced yard where a dog was barking. As we ran over there, we could not see anything but the dog. My interest quickly faded, and I refocused my attention on getting the fliers up. As I taped up the first sign, the kids came running around the corner saying screaming that one of the cats was in that yard. My brother-in-law and my collection of children went to the house and explained the situation to the homeowner. Within a few minutes Jonathan was walking out of their backyard with $700.00 Garfield in his hands! I was delighted! Not only was Garfield my favorite of the two missing cats - Garfield was also the cat that I had more money invested into... Happy Dad, Happy Children, and Happy Uncle (who had truthfully been responsible for finding the cat returning my investment.). I could (as far as I was concerned) give up now. Mimi represented “chump change” when compared to Garfield - but (to Rebecca) Mimi represented much more… Mimi represented all the things that (if never found) would break a little girl’s heart. A broken little girl’s heart is a daddy’s worst nightmare, so regardless of how “done” I was, or how flagrant my violation was going to be, we (as a group) walked around the neighborhood taping up lost cat fliers. Rebecca was glad to see Garfield back, but you could tell she was pining for Mimi’s return. It was a work day, so as I got ready, and left for work, the score was still tied 1-1. Later that night (just about dusk), I got a call at work from a VERY VERY HAPPY Rebecca. She excitedly shared with me that Mimi was now safely returned to the comforts of our warm and loving home. My wife got on the phone and said that she was all but doing cartwheels she was so excited that Mimi was back. Mimi had come in, ran to the water dish, and drank, and drank, and drank… Then she curled up in a little corner near an air conditioner vent, and fell asleep. Apparently, while visiting with my neighbors, my wife / kids spotted Mimi in the bushes in a house across the street and "kiddy-corner" from our house. Later that night, my wife called me and told me that Mimi (as she always does) curled up with Rebecca on her bunk as she went to bed. (It’s almost a ritual - whenever Rebecca goes to bed, Mimi will cimb up and curl up with her.) My wife said that Rebecca fell asleep with a smile on her face, and was even smiling in her sleep. 1. How long before a cat gets pregnant before I will be able to tell she is? 2. Do YOU want a kitten? I have made a few changes (again) to the blog. You can still click on one of the other "trifecta" blogs, and see what this blog used to look like (for comparison purposes...). Feel free to tell me what you think - and feel free to be honest! All images are click able for larger versions. 1. 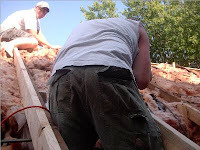 Jonathan up on the roof - helping. 2. 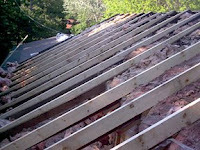 Look closely at the old (darker) rafters and the new (light colored) rafters... Can you see the "sag"? 3. Ed, I don't care what Jodi says.. After spending the better part of an afternoon with my face in it, I gotta say - you still got a nice "rump". 4. Welcome to the back forty... or "gypsy tent city". 5. Sort of hard to see, but the finished half of the house looks great! I'll get the story up here soon - but in the mean time, enjoy! This observation is inspired by the 80's Metal wordsmith Ronnie James Dio and his band Dio's 1984 song (from the album of the same name). "The Last in Line". After a road trip, visting an "event", or a long car ride (regardless of how bad you may have to "go" or how long it has been since you last "went") The father of a large family will undoubtedly be the "Last in Line" to use the bathroom upon returning home.